I have written before about how I can become quite side tracked about making birthday cakes. I wish I could walk into a supermarket and buy one, but I can't. I look at the price and think - I could do that - and it would be cheaper. Sometimes it is and sometimes it isn't, but at least I can say that I did it. This year we decided against a big party for middle man and instead had a family trip to the Legoland Hotel. The scary thing is that it was much cheaper than having a party! We had a fantastic time and you can read about it here. As we are regulars at Legoland, and have watched their pirate stunt show a million times, I decided that I would need to make middle man a treasure chest cake with golden lego bricks. I must have had this in the back of my mind as I bought a Christmas Lego bauble with golden bricks in before the park shut for the season! 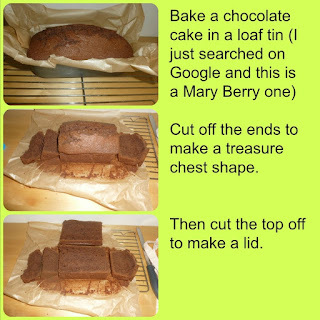 I then trawled the internet for ideas and pictures of treasure chest cakes before embarking on my own. As I found other peoples blogs really useful in this, I decided I would blog about mine as it may help someone else. So here is my guide for a treasure chest cake. Then it is just down to singing Happy Birthday and tucking right in. Hope this helps someone, and please leave a comment if you have given it a go. Wow! We are just doing one of our pirate parties at Mrs Fox's this is FAB. Oh this cake is awesome. I love it!It looks so tasty too.